According to the Mayo Clinic, the most likely causes of eczema, also known as atopic dermatiti,s are allergies and dry irritated skin in combination with an immune system malfunction. While eczema can be uncomfortable and embarrassing for the sufferer, there are some home remedies that can help get rid of eczema on the palms and inside of the fingers. However, these remedies have not been approved by the Food and Drug Administration, so you should consult your doctor or dermatologist before trying them. According to Jethro Kloss, author of "Back to Eden: The Classic Guide to Herbal Medicine, Natural Foods, and Home Remedies Since 1939," a mixture of olive oil and coconut can be used on dry skin or to help heal eczema on the body. To use olive oil and coconut oil on the palms and inside of the fingers, mix one part olive oil and one part pure, raw coconut oil in a small container or bottle with a tight-fitting lid. Put a small amount of the mixture in the palms and gently massage the oils in for one to two minutes. For even more benefit, place washable gloves over your hands and leave the oil on the skin overnight. This remedy can be used as frequently as needed as long as it does not aggravate the eczema. Note that you should use only pure olive oil and raw, pure coconut oil, as oils with added ingredients may aggravate the skin or be less beneficial. 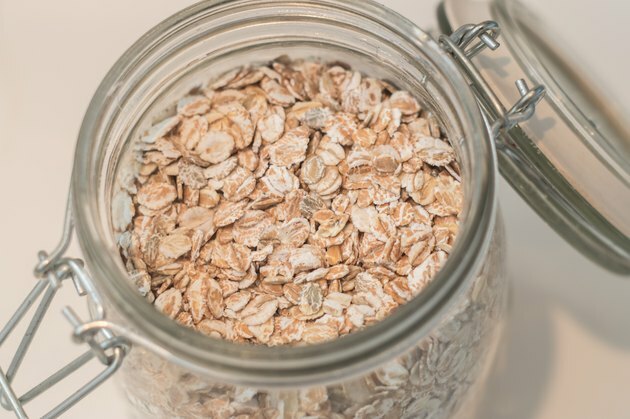 According to Mother Nature, a website dedicated to providing remedies for health and skin problems, taking a bath in colloidal oatmeal--which is simply oatmeal ground into a fine powder--can help to relieve eczema anywhere on the skin. To use colloidal oatmeal for eczema, fill your bathtub with lukewarm water and add two cups of colloidal oatmeal. Soak in the tub for 15 to 20 minutes; rinse the skin with cool water in the shower or bathtub to remove any residue and pat the skin dry with a clean towel. This should help relieve itching as well. The colloidal oatmeal treatment can be used daily as long as it does not irritate your skin or make your eczema worse. According to Melanie A. Sachs, author of “Ayurvedic Beauty Care,” a mixture of natural aloe vera gel and lavender essential oil is commonly used to help cure eczema on different parts of the body. To use aloe vera gel and lavender essential oil, mix one part lavender essential oil with 10 parts aloe vera gel in a small container. Gently apply a thick mixture to the palms and insides of the fingers, massaging gently for two minutes. Place gloves on the hands and leave the mixture on overnight. In the morning, gently wash your hands with cool water and a mild cleanser before patting dry. This treatment can be used every night as long as it does not irritate your skin.